My soon to be 9 year old granddaughter asked if I would make her a birthday cake. Even though I cannot make or decorate cakes to save my soul, I agreed. When I asked what kind of cake she wanted, she said she wanted Knock Your Socks Off Brownies made into a round cake. What?? I couldn’t imagine anything worse. Have you ever had Knock Your Socks Off Brownies? To make them, you layer chocolate chip cookie dough, Oreo cookies, Dulce de Leche, and brownie batter in a 9X13 pan. I don’t know anyone who can eat more than a bite or two because they are so rich. I couldn’t imagine a slice being eaten by anyone. But, I had promised and a promise is a promise. I used a spring form pan and it worked fine. The cake weighed about 10 pounds and I had only used half of the ingredients to make the cake. I made the rest in a square pan, as brownies. They are still in my freezer! 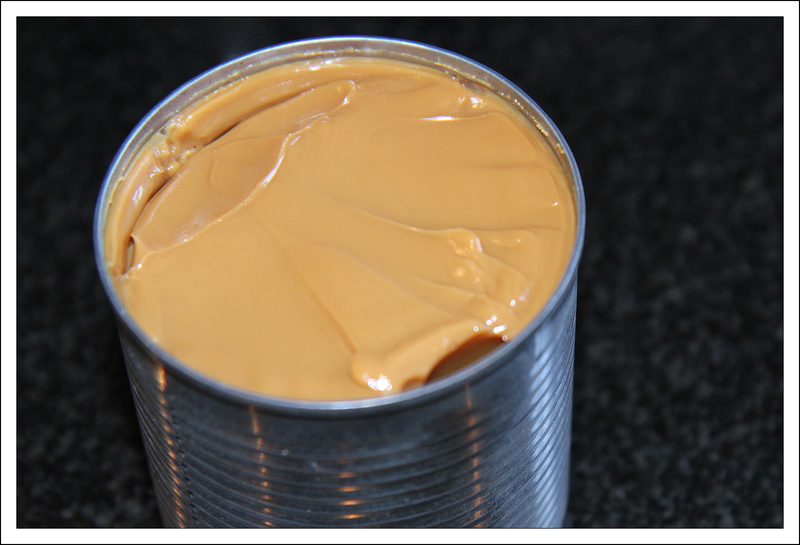 The first time I made Dulce de Leche, I had used one of my All Clad pans to cook the sweetened condensed milk. I didn’t take the paper wrapper off the can or remove any of the glue, before I cooked it. That was a huge mistake. My husband (the chief kitchen cleaner and dish washer) told me it took him forever to get the residue off the inside of the pan. I promised him that I would never do that again! When I got ready to make this can of Dulce de Leche, I needed to use my head (not a good pan). I took the paper off the sweetened condensed milk and used Goof Off to get the glue off the can. I still didn’t dare to use a regular sauce pan because I wasn’t sure what had caused the problem the last time I had made it. While looking around for another pan, I saw my old, beat up, Goodwill Store Crock Pot. I bought it for $3.00, about 10 years ago; just to keep mashed potatoes warm while preparing the rest of the Thanksgiving dinner. My sister told me to use a Crock Pot to keep the potatoes warm and she is the one who told me that she makes Dulce de Leche in a Crock Pot, after I told her what a mess I had made. The Crock Pot worked great! It has a non stick interior so I probably didn’t need to remove the glue. There are lots of instructions for making your own Dulce de Leche floating around the Internet. This is the way I make it. Take the paper off the can of sweetened condensed milk. I usually use the store brand but any brand will work. 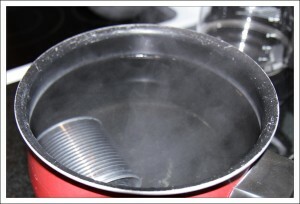 Put the can in a pot that will hold enough water to cover the can by a few inches. Bring it to a boil and simmer it for about 2- 2 1/2 hours. Let cool and when you open it you will have this amazing can of creamy, caramel tasting, Dulce de Leche.